WHEATLAND, Mo. — When it comes to the racing game, Tom Cordray has long been a one-man band. There’s no outside sponsor money flowing into the operation. The veteran late model racer does all the mechanical preparation and race-night work himself. Those facts makes Cordray’s rock-solid career in the ULMA Late Model division – including a pair of championships at Lucas Oil Speedway — all the more impressive. But after a runner-up finish at Lucas Oil Speedway in 2016, Cordray is looking for bigger and better results. He’s put his Rocket by Lanigan chassis up for sale and has a Bob Pierce car on order. 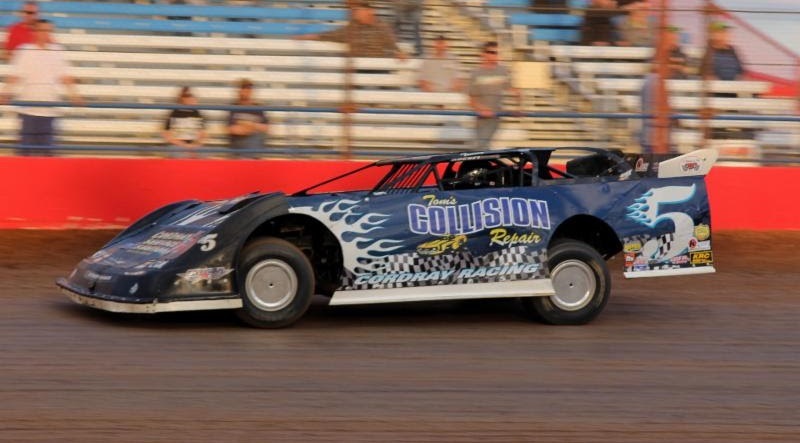 Cordray, who owns and operates Tom’s Collision and Cordray’s Used Cars in the northern Missouri town of Browning, finished 66 points behind Aaron Marrant at Lucas Oil Speedway last season. He was ninth in Lucas Cattle Company ULMA national points, with eight top-five finishes in 18 starts. “It was all right,” Cordray said in evaluating his season. “It was a good run, but I’d have like to have got a feature win. It’s so tough. The technology part … I’m behind. I have to figure something out. Cordray pointed to Marrant, the Lucas Cattle Company ULMA Rookie of the Year and national points runner-up, as a talented racer. But Marrant drives a Late Model for Bob Morton and Chris Ricketts from the Kansas City area and, unlike Cordray, has only the driving part to worry about. Cordray broke into racing at the Kirksville Speedway in the Sportsman class in 1985, driving a 1969 Chevelle he paid $500 for. He moved to Modifieds in 1989 and stayed in the open-wheel division until getting into Late Models in 2005. He won track championships at Lucas in 2009 and ’10 and has finished top five four more times since. Cordray said he’s hoping that Pierce, the veteran car-builder and one-time Late Model championship driver can provide some much-needed set-up help. The ULMA division perhaps isn’t growing by volume, but the quality seems better with each passing year. Cordray plans to hit all the division’s races at Lucas, and perhaps make some shows at Lakeside Speedway in Kansas City, Kan.